Lovely Tudor lady with a bunch of grapes. Media: Head, hands and feet of Super Sculpey, on a wire armature with a cloth body. She has very long red mohair tied with strings of tiny pearls and silk ribbons. Her underskirt is gold lame over a white cotton slip. Her overskirt is a green/gold brocade. 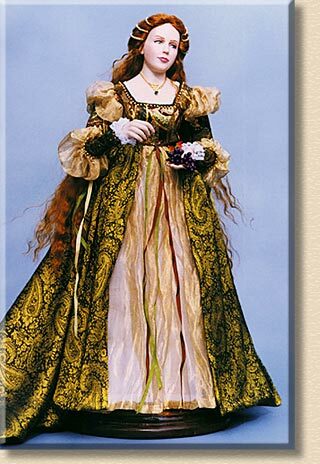 Her bodice is a green, brown and gold brocade, with yellow tricot puffs at the shoulders and elbows. She holds a bunch of grapes handmade from purple Sculpey III.